Hi, I’M MERNA LIDDAWI, AN AWARD-WINING ARTIST and MENTOR. I BRING NATURE’S DIVINE BEAUTY INTO YOUR HOME BY USING ANCIENT FORGOTTEN TECHNIQUES,GENUINE GOLD AND HAND-MADE MATERIALS TO CREATE SENSATIONAL ART. I believe art can inspire to transform and heal, bringing inner peace and solace to our lives. We need more art and beauty now than ever before as we are distracted overwhelmed in a digital age, with our computers, phones and other electronic devices. We have lost touch with ourselves, with nature and with the Creator. I want to bring spirituality and beauty into your life through my unique paintings. For me, the process of painting is a time of stillness, a moment of prayer, a moment of connection with my true self and with the Divine God. I call these moments, ‘Selah’ Moments. My mission is that you experience ‘Selah’ moments in your life too. How? 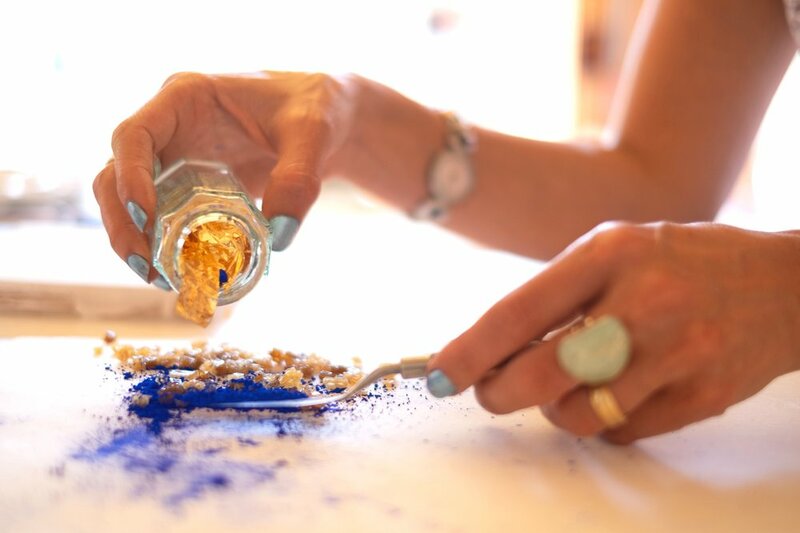 I create what I call a ‘Selah’ Space with my paintings: a space for meditation and prayer through nature’s pure elements ….. pigments, azurite, gold, chalk, egg, clay and the meditative process. It’s a space where the painting acts as a ‘window’ to experience inner peace and wholeness in a noisy world. I was born in Jordan to an Orthodox Christian family. Every week I absorbed the vibrant colours of the sacred images, listened to chanting music, smelled the incense and feasted my eyes on the shimmering gold and beauty of the icons. As a child, I also enjoyed visiting the ancient Roman ruins, old buildings that had become abstracted from their original purpose, leaving a trace. Yet becoming an artist wasn’t something that was part of my cultural upbringing. My path to painting was not a linear one. I gained a Science degree (Physics), moved to England, studied theology, married, became a Maths teacher, and a mother. And then my journey continued till I became a professional painter. I consider it a divine calling. Coming from the Middle East, neither landscapes nor figurative paintings were part of my art culture. My work instead explores ancient marks, the microscopic, the cosmos, pattern in nature, sacred geometry, influences from the relics of my childhood and spirituality of my Orthodox culture. I developed my techniques over many years of intensive practice including formal training (MFA). Inspired by the sacred icon of my youth, I gravitated to using gold, earth and mineral pigments and geometry as symbols of light and spirituality. My math training came handy! Every aspect of my art is made by hand with love and care so as to share it with my collectors. THE PAINTINGS PROVIDE A FOCAL POINT TO OUR BUSY AND HECTIC DAY TO DAY LIFE. BETWEEN RAISING TEENAGERS AND THE DEMANDING STRUCTURED WORK SCHEDULE OF A BANKER, I MYSELF FIND SOLACE IN THOSE PAINTINGS. I developed my ‘Selah’ process over many years using ancient techniques. The process brings together elements from the three kingdoms: the animal, the plant and the mineral. An alchemical process of transformation and mystery.